Minnesota natives, Jamal James and Caleb Truax scored early knockouts to cap-off an explosive and strange night at the Armory in Minneapolis. The 3-hour Premier Boxing Champions broadcast (plus 90- minute prelims) on FS1 served a purpose for the prospects and contenders looking to impress the viewing audience. From a fighter getting knocked out of the ring, to one of the most random things, a fighter walking out, the PBC on FS1 card did not disappoint. In the televised main event, Jamal James attacked the body of Mahonry Montes to the point of no return in the second round with two seconds remaining. James boxed well on the outside for most of the first frame until the closing moments, when each man took some licks. James would aim-fire to the body repeatedly to finish in great fashion. Jamal told Andrew Johnson of Huffington Post and Boxing Insider, the plan is to take a step up in competition in his next bout possible a title opportunity. Hometown favorite and University of Minnesota graduate, Caleb Truax came out firing on all cylinders behind a crisp jab mixed with subtle movement. Caleb began to land straight right hands and uppercuts down the stretch of the second round. Truax picked his punches well finding a home for more hard right hands and uppercuts in the third round, winning by technical-stoppage in the over Fabiano Pena. Prior to the fight Truax made it be known to The Ring Magazine, he wants a title shot against David Benavidez or Jose Uzcategui in the near future. 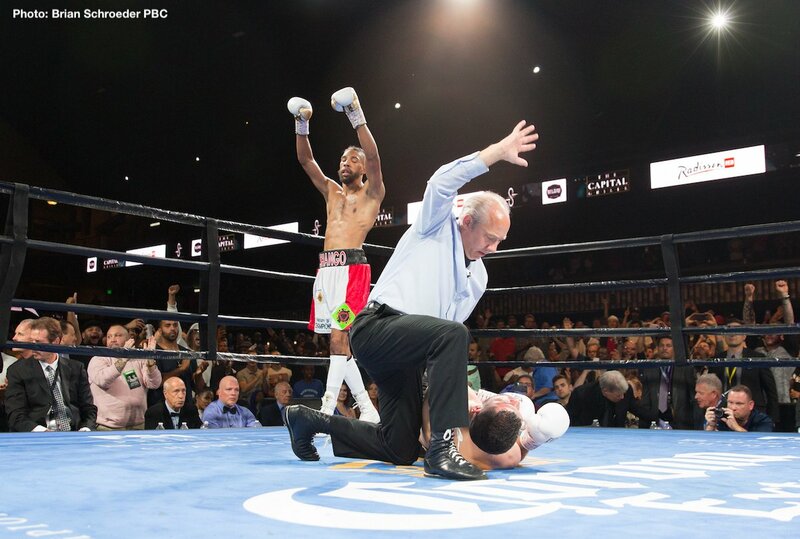 In the televised co-feature Willie Monroe won a unanimous decision over late-replacement Javier Francisco Maciel. The fight was more competitive then the judge’s scorecards, 100-90, 100-90 and 99-91. Maciel worked Monroe’s body well and managed to keep the pressure on Monroe for all ten rounds, but it was Monroe landing the cleaner punches throughout. Interim-WBC middleweight titlist Jermall Charlo was ringside as part of the PBC on FS1 broadcast team and may be a possible opponent for Willie. The unthinkable happened when Curtis Harper decided to casually walk out of the ring a second after the opening bell. Heavyweight prospect Efe Ajagba stood stunned as did the Armory crowd, shocked to see Harper stroll down the catwalk back to the dressing room. PBC reporter Jordan Hardy tweeted out that Harper walked out in protest feeling his purse was subpar. Undefeated prospect Jamontay Clark fought Jeison Rosario in what was the most entertaining bout of the night. The first two rounds were fought at a measure pace but in the third round all-hell broke loose. The fighters exchanged punches which seem to affect both, with Clark clearly getting the worse of it. The shot Rosario landed sent Clark crashing through the ropes and completely out of the ring. To his credit, Jamontay gathered himself and climbed back in to the ring to beat the 20-second count. From there on out Rosario dominated most of the rounds landing a solid jab and a plethora of overhand rights. Clark has a huge heart and a great chin, but will have to go back to the drawing board after taking his first loss. In the opening bout of the main card Lithuanian Olympic qualifier Eimantas Stanionis white-washed the hard-nosed Levan ‘The Wolf’ Ghvamichava. Stanionis’s high-level fundamentals were on display both offensively and defensively. The straight punching and tight-guard of Eimantas proved to be too much for ‘The Wolf’. Levan showed a ton of heart as the punishment continued. In what was billed as a first real test for Stanionis, Eimantas moved to 7-0 (6KO) cruising to a unanimous decision. 10-0 (6KO), Sebastian Fundura got the job done against Antonio Urista in a fast-paced bout that ended by technical-stoppag. Fundora established his offense with right hooks and straight lefts to the head and body early. The two-way action picked up in the 3rd round, Fundora let his hands go with more straight lefts and added several upper cuts enough to bloody Urista’s nose. Urista landed looping counter overhand rights off the ropes but took too much damage forcing the referee to halt the contest in the 4th. The prelims included Antonio Russell 12-0 (10 KO) and Efetobor Apochi 5-0 (5 KO), winning via first round knockouts. Now 8-0, Leon Lawson III used his length to box on the outside defeating Brandon Adams in a 6-rounder. In the first fight at the site off-television, Willie Jones of Tampa, Florida, stopped previously unbeaten Minneapolis prospect Celso Ramirez. The official attendance for the PBC on FS1 from The Armory was 3,574, outselling their last event in April. Next boxing news: RESULTS: Efe Ajagba Scores 0:1 Second Win Over Curtis Harper – Video!